Since 1989, Blancpain has equipped many of its prestigious Villeret watches with a flying tourbillon. 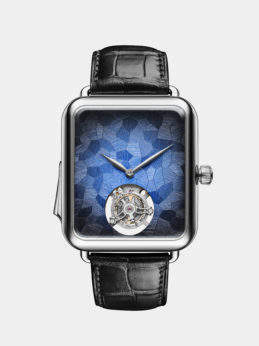 This year, it adds jumping hours and retrograde minute functions to the already complicated piece. Created in a 42mm 18K rose gold case, it houses an all-new, hand-decorated movement produced in the brand’s high-watchmaking department. 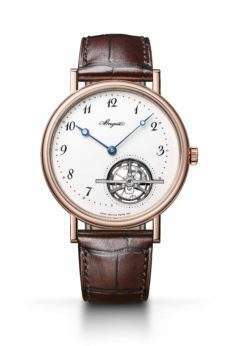 While a flying tourbillon is devoid of an upper bridge, Blancpain takes this to the next level and removes the lower bridge as well, replacing it with a clear sapphire disc so that the tourbillon cage, balance wheel and escapement truly appear to be spinning in space. 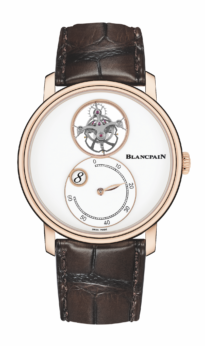 The classic white Grand Feu enamel dial is created by Blancpain’s artisans using the champlevé technique, wherein the gold dial is hollowed out to create separate portions into which layers of enamel are hand painted, then fired multiple times. The fine finishing of the movement, and the power reserve indicator depicted via a guilloché disc are visible via a transparent sapphire caseback.